Ebates is a cashback portal that offers you rebates when you shop or make travel bookings online (just like Shopback). For a limited time, Ebates is running a Valentine’s Day travel sale, and Milelion readers are eligible to take part in a US$250 Visa gift card giveaway. To take part in the giveaway, you’ll need an Ebates account. If you don’t already have one, you can sign up via my link and get an extra $10 cashback after your first eligible purchase (I also earn a referral credit). Entries close 4 pm Singapore time on Saturday, February 23, 2019. The US$250 gift card will be issued in virtual form, so no worries about your geographic location- anyone who reads The Milelion is eligible to participate! Unlike Shopback, Ebates does not have a Singapore bank transfer option. However, you can opt to receive your payout via PayPal, which subsequently allows you to cash out your balance to your bank account. 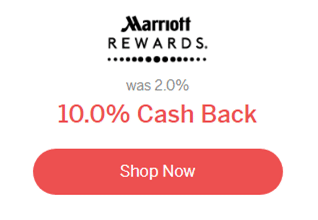 Marriott is once again offering 10% cashback on bookings made through Ebates. This covers brands under both the Marriott and Starwood umbrellas, with limited exceptions (see below). Remember that when you book through Ebates, you’re redirected to the Marriott.com official website so you’ll earn elite status credit and points as per normal. Your cashback for eligible stays should post to your Ebates accounts within 6 weeks of completing your stay. Even if you’re not sure about your travel plans, you can always book refundable rates to lock in your 10% cashback first. Properties: Atlantis, Autograph Collection, Bulgari Hotel, London, Joshua G.E. Medical Corp. Conference Center, Jesse Jones Rotary Conference Center, Marriott Ranch, Protea Hotel Amani Beach, Protea Hotel Mbweni Ruins, The Ritz-Carlton London, U.S. Postal Service Conference Center, Four Points by Sheraton Havana, The Cosmopolitan Las Vegas, Autograph Collection. 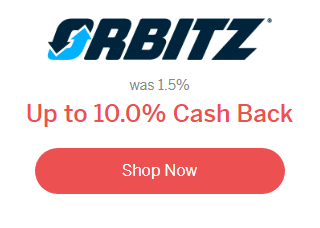 Orbitz is offering up to 10% cashback on travel bookings, including 2.5% on hotels. Cashback will not be earned when a coupon code is used in a purchase, and is not available on insurance, travel services and third party fees. 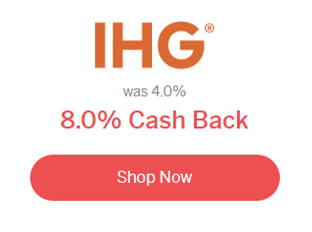 IHG brands such as Holiday Inn, Intercontinental, Regent, Crowne Plaza and more can now be booked with 8% cashback. As was the case with Marriott, booking through Ebates sends you to IHG’s official site, so you’ll earn your elite points and status credit as usual. Your cashback should credit within 6 weeks after your stay is completed. 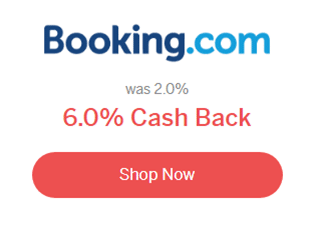 Booking.com is offering 6% cashback on hotel bookings worldwide. Cashback will be credited within 3 months of completing your stay. 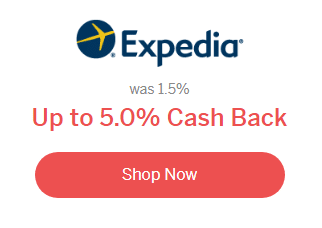 Expedia is offering up to 5% cashback on bookings, including 4% cashback on hotels. 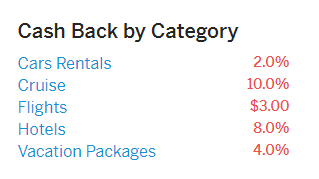 Do note that Shopback is currently offering 6% back on Expedia hotels, so you may want to keep that in mind when doing comparison shopping. 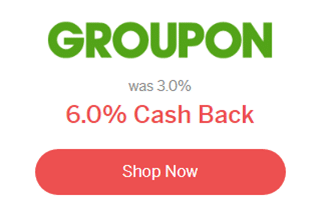 Groupon is offering 6% cashback on activities and deals, excluding gift cards, getaways and Groupon+ purchases. Whenever I travel, I find it helpful to check if the activities I’m planning to do can be found for less on Groupon. This helps me save significantly, especially when Groupon runs concurrent deals. For example, I booked a segway tour in San Francisco that sells for $75 on the official site for $45 on Groupon, less a further 20% discount for a net price of $36. 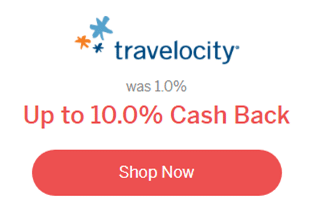 Travelocity is offering up to 10% cashback on travel bookings, including 8% cashback on hotels. Your cashback will be added within 6 weeks after completing your travel. 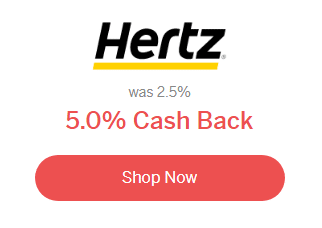 If you’re looking to book a car, Hertz is offering 5% cashback on car rentals around the world. This will credit to your Ebates account within 1 month after your rental is completed. You won’t earn cashback on any upsells you purchase at the counter at the time of pick-up, nor on corporate or government rates. However, you will be able to use regular discount rates like AAA (Singapore AAS members are also eligible to use AAA rates) as per normal. Have a look at the travel deals and make your bookings to take advantage of the upsized cashback. Be sure to enter your details to register for the gift card giveaway, and look out for details of the winner on our Facebook and Telegram channels. i am surprised you are supporting… CASHBACK! nothing stopping you from earning both! 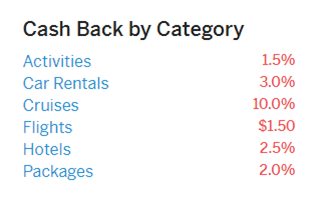 with the current PRVI + expedia 10mpd promo, is there any way that I can book a hotel through expedia with PRVI via shopback, get 10mpd AND 6% cashback? Currently I believe that in order to qualify for the 10mpd, I have to go via the UOB link to place bookings; so its either you get 10mpd with PRVI or 6% cashback (and 1.4mpd) with shopback. Hi Aaron, thanks very much for the heads-up. I made a hotel booking (re-routed from Ebates) but for some reason the reservation is not showing on my Ebates account. … I suppose these things don’t update themselves immediately? Thanks once again, hope it works out fine. Give it 24 hours at least? Next Entry Have your bonus Hilton points from the AMEX Membership Rewards transfer promo posted yet?